A couple of years ago we went to Caleta de Fuste in January which was absolutely bliss. The flight was about 4 hours and the transfer only 15 minutes! We stayed in an all inclusive complex close to the beach and it was a short walk to the harbour and a shopping centre. If Fuerteventura holidays is something you are thinking about I would definitely recommend looking at this resort as it was very family friendly, Lucas was 11 months at the time and there was plenty of activities for older ones too. As well as Fuerteventura, the other Canary Islands are fab options as they all have sunshine throughout the Winter and they are within 4 and a half hours flight. When we were in school, we were lucky to been taken to Lanzarote, Gran Canaria, Fuerteventura and Tenerife during the Feb holidays. There is everything you need from relaxing on the beach, watersports, children’s activities, shopping to carnivals. I remember watching a carnival whilst we were on one the islands and the colours, floats and music marching through streets were spectacular. My friend recently went to Cape Verde and her 2 year old had an amazing time. The flight is approximately 6 hours from the UK. Cape Verde has an abundance of white sandy beaches, children’s activities, turtle spotting, horse riding. It looks like an incredible place to learn about a new culture. Although it isn’t as hot as Cape Verde or the Canaries, Portugal is one to be considered as the temperatures still reach to 22 in Autumn and 16 in Winter and it is less than 3 hours flight time. There are numerous activities designed for the little ones, both outdoors and indoors, in castles, museums, zoos, theme parks and aqua parks. Following the footprints of dinosaurs, watching dolphins and whales at sea or learning about the stars. 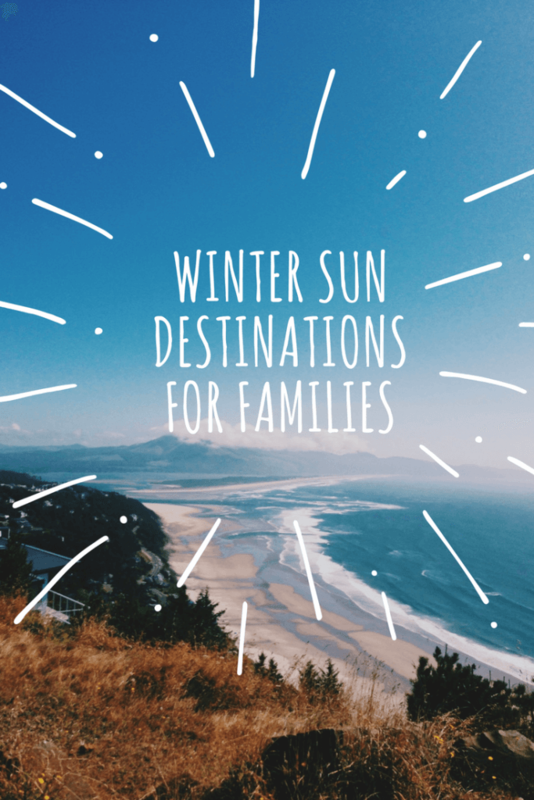 I would love a bit of winter sun – sounds like a great idea! I love the picture of Lucas with sand all over his face – so sweet! I’ve never been on a sun holiday during winter before, but it sounds rather tempting! I’ve just come back from an amazing cruise in the Caribbean and am struggling with this Scottish winter already. I need to go back to the sun! The photo of your child with sand all over his face made me smile 🙂 Mine have eaten way too much sand, from a sandpit as well as sandy beaches.